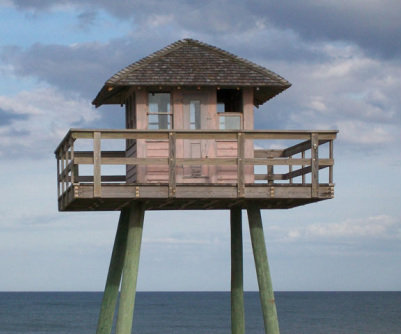 When I was a teen, I worked a job that required me to drive north of Ormond-by-the-Sea on A-1-A in early morning hours, and I would almost always look to the seaside to catch a glimpse of the World War II watch tower that stands sentinel over the beach to this day. It’s the last remaining tower in our area from the days when teens had opportunities to do meaningful war effort work. depleted of its young men"
At an October meeting at the Halifax Historical Museum, a panel of six “former teenagers” shared stories of the time when the isolationist movement led by Charles Lindbergh to keep America out of the war was dramatically replaced by the trauma of learning that Pearl Harbor had been bombed, and life for the teens changed entirely for the next four years. Volusia County's population then was about 54,000 (fewer than the number of people who now live in Daytona Beach alone), and Flagler County’s population was only 3,000. Suddenly Daytona was being depleted of its young men. Older teens were dropping out of school to join the war. Men were being drafted, leaving the town short-handed of workers. Doctors, of course, were called away to war, so teenager Carol Underwood’s father, a pharmacist and chemist, was often called on to treat injuries. With so many men gone from Daytona, many teens began to work part-time jobs, as Carol did. The world was indeed changed, and Jay Adams, whose family had just built the Miramar Tourist Court motel on the beachside the year before, faced the abrupt end to tourism as gas rationing became the law, and even local high school sports teams were restricted from traveling. Elastic rubber was also vitally needed for troop use, and the mother of teenager June Hughes had to resort to using a button–a single button–on her daughter’s homemade underwear, which ended in a minor accident later that forced the young teen to sit down immediately and to remain seated for the evening at a dance when she spotted her single button on the floor at her feet. With boyish nostalgia, Vince Clarida recalled that even candy was redirected to men in the war effort and that sugar continued to be rationed until a year after the war had ended. Plentiful food supply was no longer possible, and rationing was also experienced by grocers. Families were encouraged to plant “Victory Gardens,” but Vince Clarida recalls that when his family attempted to grow a garden on South Segrave Street during the war, they were successful in growing only some carrots. Teens and children joined the war effort at schools, and Clarida made this tangible when he passed around his War bonds (“Defense Bonds“) booklet, partially filled with ten-cent stamps pasted in 70 years ago in hopes of filling it to be redeemed for a $5 bond to help win the war. The top half of car headlights had to be painted black, and June Hughes recalled that the beach was closed in January 1942, the month after Pearl Harbor; and nightime access to the beach was restricted for years until the blackout ended in May 1945. German ships sank many American tankers, and Jay Adams remembered tar balls would wash onto the beach, and he and other daytime beach-goers could stop at special cleaning places when leaving the beach where they could clean off their feet with kerosene. Carol Underwood remembered that one Sunday afternoon some Daytona teens at the beach spotted a German submarine as it came to the surface in the daylight, so they rushed home to warn their parents, but no invasion occurred. At another time during the war, though, German saboteurs did come ashore near Jacksonville, but they were captured, and both horse and dog patrols were instituted along Atlantic beaches. Vince Clarida recalled that the Ground Observer Corps had 30-foot towers five miles apart on the beach and that one was also on City Island. Glenn “Smitty” Smith, along with other teenagers, joined the Civil Air Patrol, and he remembered riding in a Piper Cub that flew 65 mile-per-hour searching for enemy submarines along the coast and also hearing Navy fighter bombers fly over houses in Daytona, even at night. He also recalled that the quiet town had become a busy place after the WACs (Women’s Army Corps, formerly, Women’s Auxiliary Army Corps) began training on the beachside. Buses ran every fifteen minutes, but they were always full of WACs. Vince Clarida said that in 1942 a tent city that housed 6,000 women was originally set up at Bethune Point along the Halifax River until the cantonment center was built in the Welch area, now the site of Daytona State College. Daytona Boat Works built 110-foot subchasers on the west side of the Halifax River south of the marina, and Vince Clarida noted that they had 375 employees in this war effort, including his father. June Hughes added that each boat was christened and that as a young teen she had yearned to be chosen to christen one of the subchasers. Wounded American servicemen were treated at Halifax Hospital which had been appropriated for military use, and Carol Underwood recalls that she and other young teens were asked to attend a dance in formal dresses, but because the men were in their 20′s she felt uncomfortable and chose not to go again. The war effort is poignantly depicted in the reminiscences of numerous Daytona area citizens in Virgil Taylor’s and Bob Arcuri’s engaging hour-long film, The Home Front (sold at the Halifax Historical Museum and available at public libraries).